Shot with an in-camera crop. Click for original image. Click here for the RAW file. 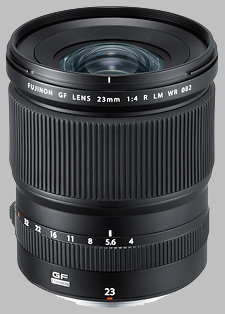 Like the other Fujinon GF lenses, the GF 23mm f/4 is ruggedly built. The lens has a metal barrel and offers weather, dust and freeze resistance. There is a rubber gasket around the lens mount too, ensuring protection against moisture in this sensitive area. Fujifilm states that the lens is cold resistant down to 14° F (-10° C), which I can't test at this time but will absolutely put to the test during the cold Maine winter. For what it's worth, the GF 32-64mm has the same rating and it did fine in a blizzard. The 23mm lens is aesthetically consistent with other Fujifilm GF lenses as well, with its semi-gloss black finish and engraved white markings. Unsurprisingly given the prime's price and Fuji's pedigree, the 23mm f/4 R LM WR exudes quality. Along with its sturdy construction, the lens has some heft. The GF 23mm weighs 1.86 pounds (845 grams), which is heavy for a prime of this focal length and maximum aperture. Before the lens released, I was a little disappointed that it wasn't an f/2.8 lens, but honestly, if it were, it'd be very heavy, all else equal. The lens is already quite big; it is 4.1 inches (103.0 millimeters) long and its maximum diameter is 3.5 inches (89.8 millimeters) and has an 82mm filter thread. Given the size of the GFX 50S body itself, the GF 23mm f/4 balances very well, especially if you have a vertical grip on the camera. The lens hood is a petal design and it rotates nicely onto the lens. It clicks firmly into place and has a button you press to release it. It is not particularly big, measuring just under two inches (a little under 50 millimeters) at its longest. The GF 23mm also comes with a soft pouch, which is the same one supplied with the GF 32-64mm f/4 lens. A harder case would be nice, but the pouch is decent. The focus ring feels very good for a focus-by-wire lens. Rotation is smooth, and the ring itself offers a nice grip. At about an inch and a half wide (around 35 millimeters), there is a lot of surface area for manually focusing the lens. The aperture ring, which sits closer to the body, feels good too. Full stop markings are engraved on the lens. Although not a surprise given that all available GF lenses have released within a few months of each other and obviously had a lot of overlap in their research/development and production phases, it is nice that all three GF lenses I've used, the GF 63mm f/2.8, GF 32-64mm f/4 and now the GF 23mm f/4, all have focus and aperture rings which feel essentially identical to one another. It is good to have the system feel so cohesive. I hope this remains the case as Fujifilm continues to develop and release new lenses for the GF system. Overall, the build quality of the GF 23mm f/4 R LM WR is excellent. The weather resistance is very nice, and the lens feels like it's built to last. I wouldn't want to test just how rugged it is, but I would trust it in difficult conditions, which is important given its price. At $2,600, the GF 23mm f/4 has the build quality to back up its steep price. Does the optical quality also justify the price? On paper, the GF 23mm f/4 is an optically complex lens. It has 15 elements across 12 groups, including two aspherical lenses, one super ED lens and three ED lenses. Despite its 99.9° angle of view, the lens is designed to suppress distortion. Further, it has been designed to offer consistent performance across the entire frame, which we will look at shortly. Further, to help deal with ghosting and flare -- potentially big issues for wide-angle lenses -- the optics have Fuji's Nano GI coating. In the center of the frame, the GF 23mm lens is very sharp, even when shooting wide open at f/4. In fact, when viewing images at 100%, there is very little discernible difference in the center of the frame between f/4, f/5.6 and f/8. At f/11, diffraction starts to show up, although very minimally. At f/16, the lens is still okay, but at f/22 and f/32, you are basically wasting the potential of the GFX's sensor because the images are very soft. What about at the edge of the frame? While there was not a lot to differentiate the GF 23mm f/4 R LM WR in the center of the frame at f/4 and f/5.6, the situation is quite different when considering the edges of the frame. At f/4, the edge of the frame lacks a bit of contrast, and it's overall somewhat soft compared to the center. Even at f/5.6, however, where the center of the frame looks great, the edges are still a bit blurred. Stop down to f/8, though, and the entire frame is very good. Based on the excellent resolving capabilities across the frame, f/8 has proven to be my go-to aperture for landscape work. 100% top right corner crop of JPEG image. Click for original image. Click here for the RAW file. 100% left edge center crop of JPEG image. Click for original image. Click here for the RAW file. It is difficult to overstate just how good the optical performance of this 18mm-equivalent lens is on the medium format GFX 50S camera. It's often not easy to get good performance from a lens this wide, especially across the entire frame, but the GF 23mm f/4 manages to accomplish that feat, even if its corner performance wide open leaves a bit to be desired. A medium format sensor and a wide-angle lens are not the best combination when it comes to vignette performance, and the GF 23mm f/4 is no exception. At f/4, the falloff is considerable and would be very noticeable in some real-world situations. With that said, at f/5.6 the situation is much improved and at f/8, you'd be hard-pressed to find any noticeable vignetting in all but the most demanding real-world situations. If you do notice vignetting in your shots at f/8, go ahead and stop down to f/11, which should take care of the problem. This image has been blurred to reduce some of the detail and to better illustrate the falloff. Click for original image. Click here for the RAW file. Longitudinal chromatic aberration is very well controlled by the GF 23mm lens, even wide open. There is some minor chromatic aberration visible at f/4, but at f/5.6 and f/8, the situation improves and it is not a significant issue. Lateral chromatic aberrations, such as purple fringing, are very well controlled by the lens and even very challenging situations did not produce noticeable fringing issues. 100% crop from an uncorrected RAW image. Click for original image. Click here for the RAW file. 100% crop from a straight from the camera JPEG image, which can be seen in full below. There are no issues with purple fringing to be found here, not even with the very fine black hair against the sky. Click for original image. Click here for the RAW file. Click for original image. Click here for the RAW file. Although the lens' maximum aperture of f/4 makes it a less than ideal choice for night sky photography, it is still the best native option within the GFX system at the moment. As we can see in the crop below, the GF 23mm f/4 handles comatic aberration quite well, even in the very corner of the frame. 100% crop from a modified RAW image, which can be seen in full below. This crop is from the very top right corner of the frame and you can see some comatic aberration in the form of blobby and non-circular stars, but it is not bad at all and is slightly exacerbated by the overly long exposure, which is necessary to help compensate for the f/4 maximum aperture of this lens. Click for original image. Click here for the RAW file. A lens as wide as the GF 23mm f/4 (which is an 18mm-equivalent when considering a lens on a 35mm camera) is likely going to display some distortion. While the image below is not a perfect test case, it does help demonstrate that distortion is generally very well-controlled with the GF 23mm f/4 lens. This is a resized and exported RAW image with default lens corrections applied. Click for original image. Click here for the RAW file. Having worked with the GFX 50S and three different GF lenses, I know that expectations for autofocus speed must be tempered. It is never going to be a speedy camera, no matter what lens. With that said, the GF 23 f/4 focuses pretty quickly. The lens uses an inner focusing AF system, and it is driven by a linear motor resulting in quiet autofocus. Whereas the GF 63mm f/2.8 lens occasionally frustrated me with some focus inaccuracy and the GF 32-64mm can be very sluggish at times, the GF 23mm was consistently good in terms of accuracy and speed. While autofocus performance is good, I wish that the GF 23mm f/4 had a closer minimum focusing distance. The close focus distance is 15 inches (38 centimeters) and that provides a maximum magnification of 0.09x (1:11.1). Obviously, this lens is not designed to be a macro lens and you shouldn't expect anything resembling macro focusing performance, but for wide-angle landscape work, I sometimes like to have close foreground elements and the GF 23mm limited me on a couple of occasions in that regard. While my GF 32-64mm f/4 lens Field Test is in the works, I wanted to show the field of view of the GF 23mm f/4 when compared to the GF 32-64mm f/4 lens at 32mm. GF 23mm f/4. Click for original image. Click here for the RAW file. GF 32-64mm f/4 at 32mm. Click for original image. Click here for the RAW file. In the field, the GF 23mm f/4 lens proved to be a fun optic to work with. The prime lens offers a very wide angle of view which works really nicely with the GFX 50S. Further, the autofocus speeds were quite good, even in lower light, which surprised me given its f/4 aperture and the GFX's generally slow autofocus. 100% crop of the above image. Click for original image. Click here for the RAW file. When shooting landscapes, the wide angle of the lens can render polarizers a bit harder to work with, as blue skies can take on an uneven appearance as lenses get very wide. With that said, the 82mm circular polarizer I used with the GF 23mm f/4 worked quite nicely and didn't cause any vignetting issues. The lens is quite heavy, as I've mentioned before, and that did matter when out in the field, making the already fairly hefty GFX 50S (with EVF and tilt adapter and the vertical battery grip) a bit heavier to trek around with. With that said, I found that the weight was well worth it, as the combination delivered sharp images across the entire frame. As Fujifilm continues to expand its GF lens lineup -- which as I noted in my Fujifilm GFX 50S Field Tests is absolutely critical in the nascent stage of the GFX system -- the GF 23mm f/4 R LM WR is a true highlight in an already impressive array of optics. The GF 32-64mm is a great landscape lens given its versatility and fairly wide focal length (25mm equivalent at its widest), but a wider lens was a must-add to the GF lineup and Fujifilm truly knocked it out of the park with the GF 23mm f/4 lens. It is incredibly sharp across the frame, which is a great accomplishment given its focal length and the demands of the high-res Fujifilm GFX 50S' sensor. This image has been focus stacked and modified. Click for one of the original JPEG images. Click here for one of the RAW files. While its $2,600 price tag is steep, for landscape photographers and architectural photographers, I think it is worth every penny (and it's a lot of pennies). The Fujifilm GF 23mm f4 R LM WR is a brilliant lens and a big achievement for Fujifilm. Any Fujifilm GFX owner looking for a wide-angle lens, you simply must try out the GF 23mm. I have shot with many wide-angle lenses over the years and believe the GF 23mm is the best I've ever used. (From Fujifilm lens literature) GF lenses achieve ultra-high resolution and are capable of supporting further enhancement in future. Utilizing the knowledge cultivated through the development of the XF lenses, GF lenses are Fujifilm's finest class of lenses and were designed by amassing various technologies of Fujifilm. They are designed to fully unlock performance potential of the GFX 50S. The Fujinon GF 23mm f/4 R LM WR doesn't have any user reviews yet!